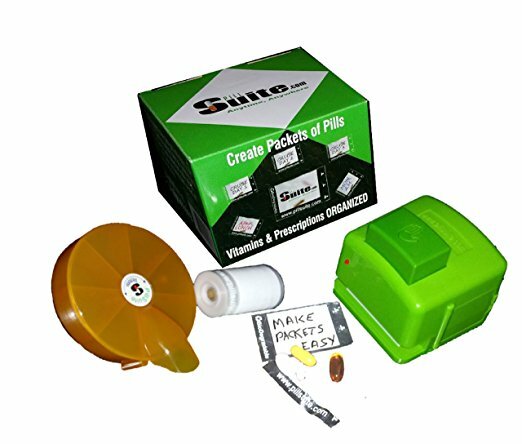 So if you’re like me and you take several supplements for the good of your health, but you don’t like having to dose them out each day or multiple times a day, and you’re all about saving space, you should grab one of these PillSuite Pill Boxes and Pill Containers kits. Now it’s super easy to stay on track with your own custom combos, and what’s even better is that they go anywhere. Take your packets to work with you for the lunchtime doses and tuck them neatly into your travel gear for your next trip, instead of trying to find room for the those cumbersome old pill organizers that can take up a square foot inside your luggage. All it would take is a little bit of time with the PillSuite kit to make up packets for an entire week or month. Each kit comes with the sorter, sealer, 400 “suites” (2 rolls of 200 on each), and 4-AA batteries to start you off right away as soon as your kit arrives. .
I’m looking forward to replacing all my supplement bottles taking up space in my kitchen with one neat little basket of PillSuite packets to grab and go so I never miss another dose. Have a suggestion for a cool product or great deal that you think Daily Caller readers need to know about? Email the Daily Dealer at dealer@dailycaller.com. The Daily Caller is devoted to showing you things that you’ll like or find interesting. We do have partnerships with affiliates, so The Daily Caller may get a small share of the revenue from any purchase. NBA Player Gets Ejected After Making Incredibly Stupid Decision. Does He Deserve A Massive Fine?